Yesterday at 6:00PM the farewell service for Blessed Elder Joseph of Vatopaidi took place in the Katholikon of the Sacred Monastery of Vatopaidi, and at 9:00PM was followed by refreshments in the Synodikon of the Monastery and Trapeza. 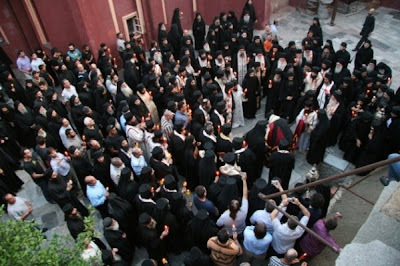 At the funeral there were 4 archbishops, 10 abbots, the Holy First Elder Symeon of Dionysiou with the Sacred Supervisors of the Holy Mountain, as well as dozens of priests and hundreds of faithful who upon hearing of the passing of the Blessed Elder came to the Monastery from many parts of Greece and Cyprus leaving behind any pending tasks or activities (one of whom was me). 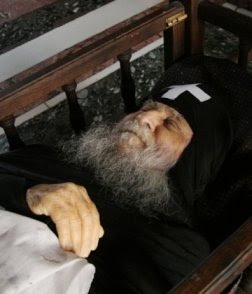 Those who spoke at the funeral were the following in order: His Excellency Metropolitan of Limassol Athanasios; the Abbot of the Sacred Monastery of Vatopaidi Archimandrite Ephraim, who as a spiritual child of the Elder was especially moved and emphasized the great paternal love of the Elder having lived all these years and associated with the Elder. 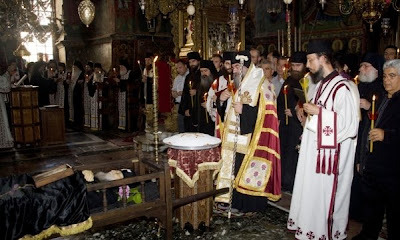 There followed His Eminence Metropolitan of Kastoria Seraphim who spoke of the Elder offering himself towards lay christians with his comforting and discerning words and letters, and further became a model of forgiveness and forbearance to those who wrongly criticized and slandered him. 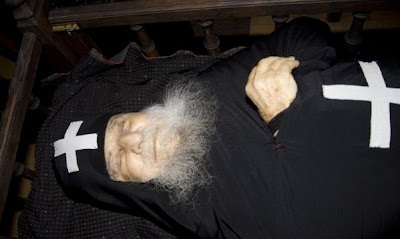 At the Synodikon the Abbot of the Sacred Monastery of Simonas Petras Archimandrite Elisaios emphasized that Elder Joseph was a point of reference for the Holy Mountain, who counseled with the desire for the monks to love God. Every meeting with the Elder was an experience. Those who attended the funeral had the blessing to give the Elder a last embrace and to receive for the last time his blessing. However those who were there were not found to be with a cold relic, but gazed at a jovial, personable person as if he was giving them a smile from eternity. 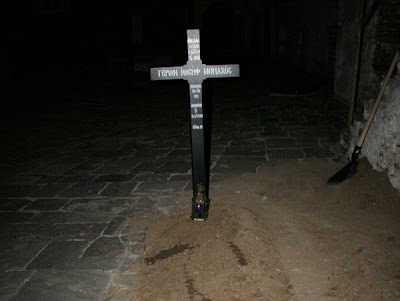 As for me, this was the first time in my life that I saw such an expression as if he was alive, though dead (you can see the face of the Elder in the photographs). The entombment of the Elder did not take place at the cemetery of the Monastery, but in a place northeast of the Katholikon which he had prepared for himself a few years before. All those present were confident of the Elder's rest at the right hand of God. The emotions were mixed, sadness mixed with resurrection joy. May we have his blessing.